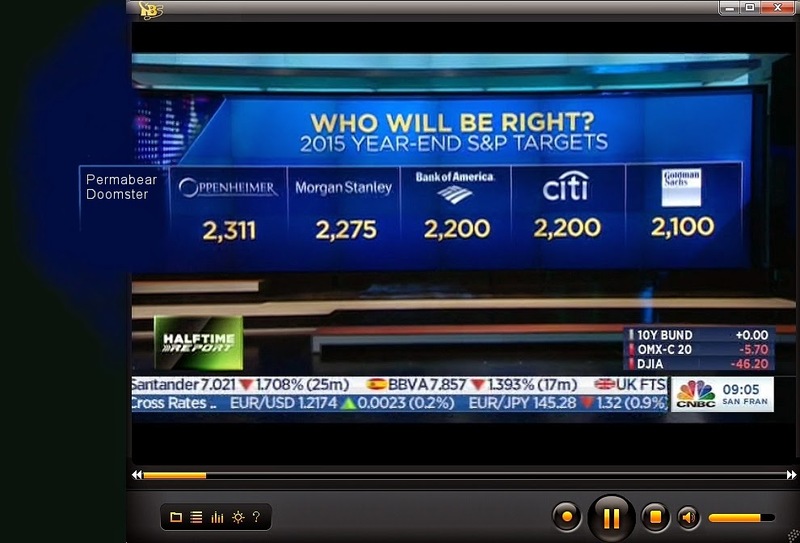 US equities closed moderately weak, sp -10pts @ 2080. The two leaders - Trans/R2K, settled lower by -0.2% and -0.5% respectively. The smaller hourly cycles are suggestive of another wave higher into mid January... to the sp'2130/50 zone. A touch of renewed weakness into the close, but really... moderate declines are nothing for the equity bears to get excited about. .... just one trading day left of the year........... thank the gods! Little to add... on what was just another quiet day of pre-holiday trading. 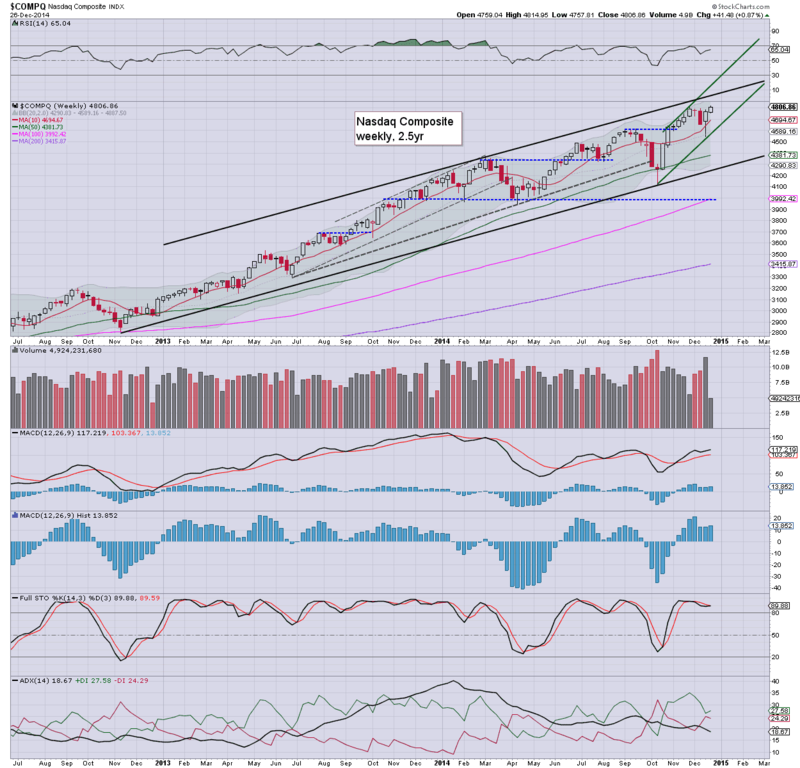 *still time to submit your end-2015 sp'500 prediction.. see HERE for details. There is no sign of a latter day rally, and market has broken new intraday lows of sp'2079... ohh the humanity, a red close? 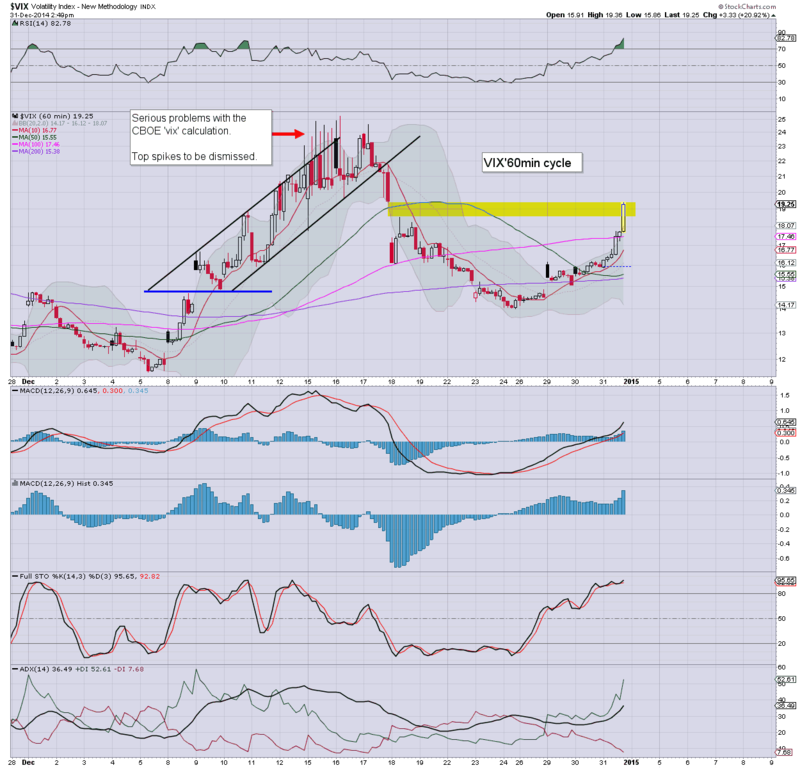 Metals are broadly holding gains, Gold +$17. 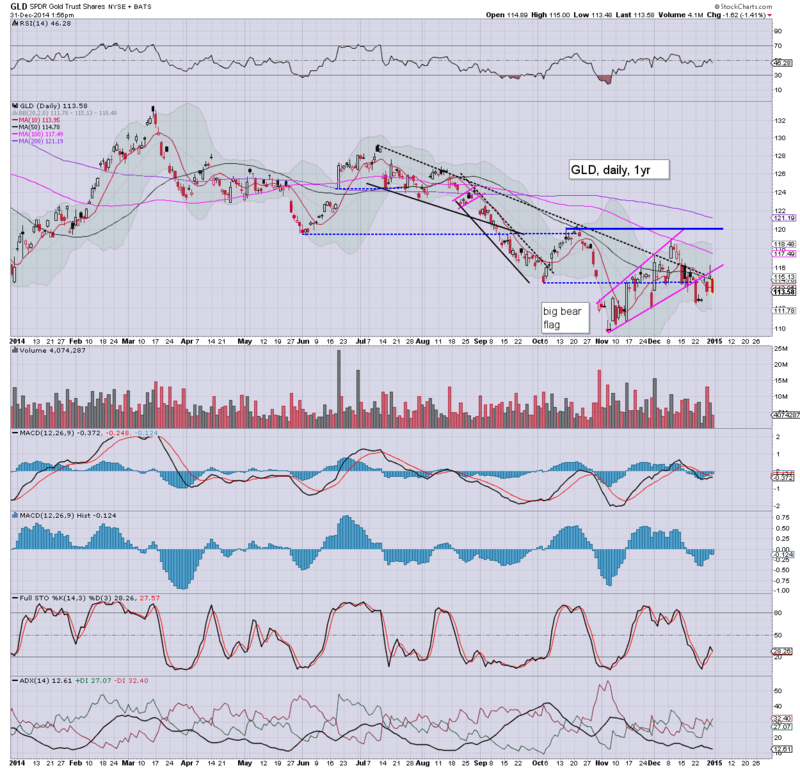 Oil remains in chop mode.. having broken support yesterday, +0.4%. *daily MACD (blue bar histogram) is starting to rollover, but I can't take any of this seriously.. not least with it being a holiday week. No sign of buyers today.. but then.. neither are there many sellers out there. It is merely a minor down wave.. before sp'2100s.. which are STILL possible tomorrow. Equities remain moderately weak... with a very viable latter day rally. Metals are holding strong gains, Gold +$19, with Silver +3.2%. Oil has already turned a touch red, having earlier bounced by around 0.6%. 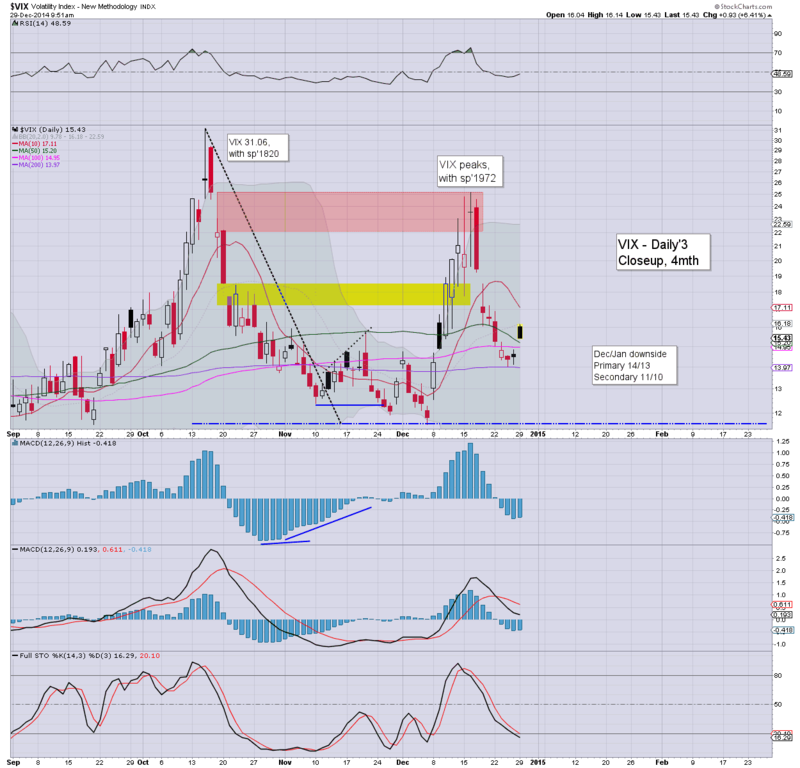 VIX is higher for a second day, but overall.. showing no real upside power. By definition, it is an extremely bullish signal.. and it utterly bemuses me how some are calling for major downside.. even to the sp'1800s in early 2015. DRYS -7.0%.. no doubt, the penny share buyers are meddling a lot in this one lately... price action sure suggests that is the case. 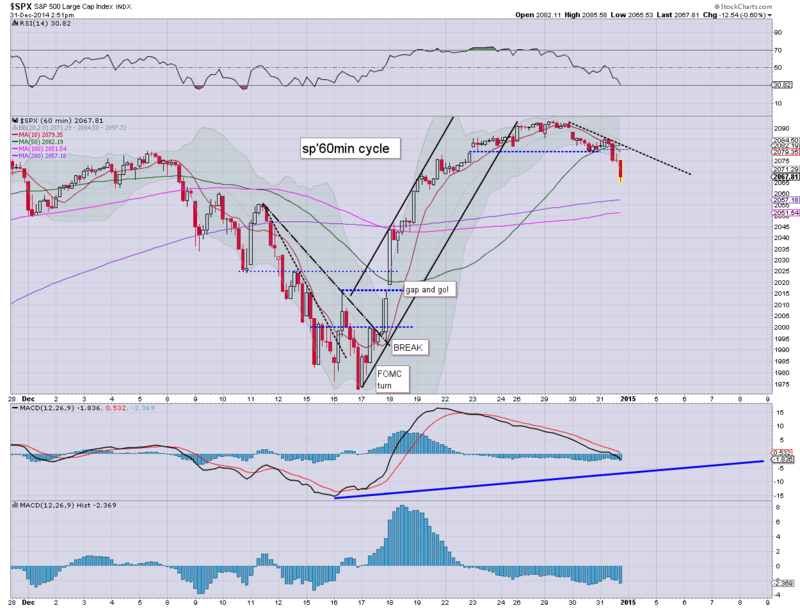 US equities are moderately lower, but look set for a latter day rally. 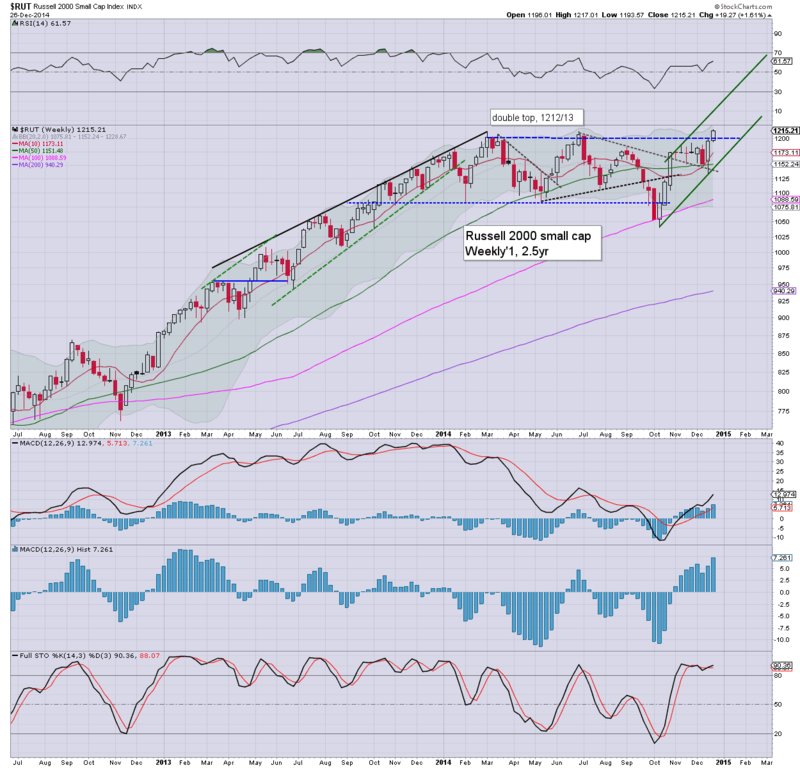 The sp'2100s are still on course, not least with the recent breakout in the R2K. Oil remains choppy, and has already started to cool from the earlier high. 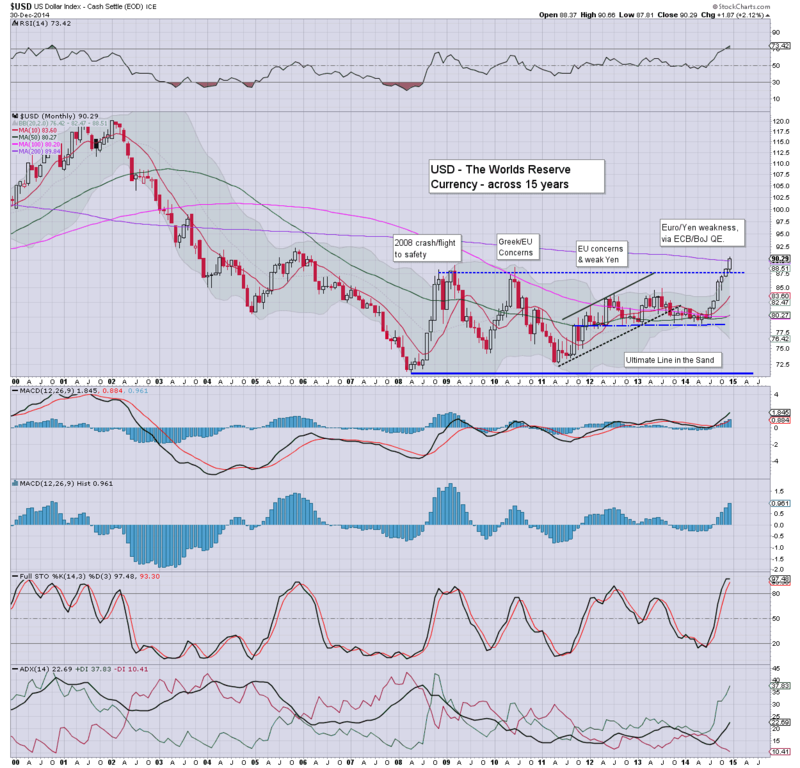 Metals are building gains, Gold +$21... but having been broadly choppy since September. So... anyone want to get overly excited about this mornings minor down cycle? Seriously, any top callers out there today? Market looks set for at least some degree of latter day rally... as has often been the case across the last few years. US equities open much in the style of yesterday morning.. a little lower, but with declines that look likely to be fully negated within a few hours. Metals are holding gains, Gold +$15. 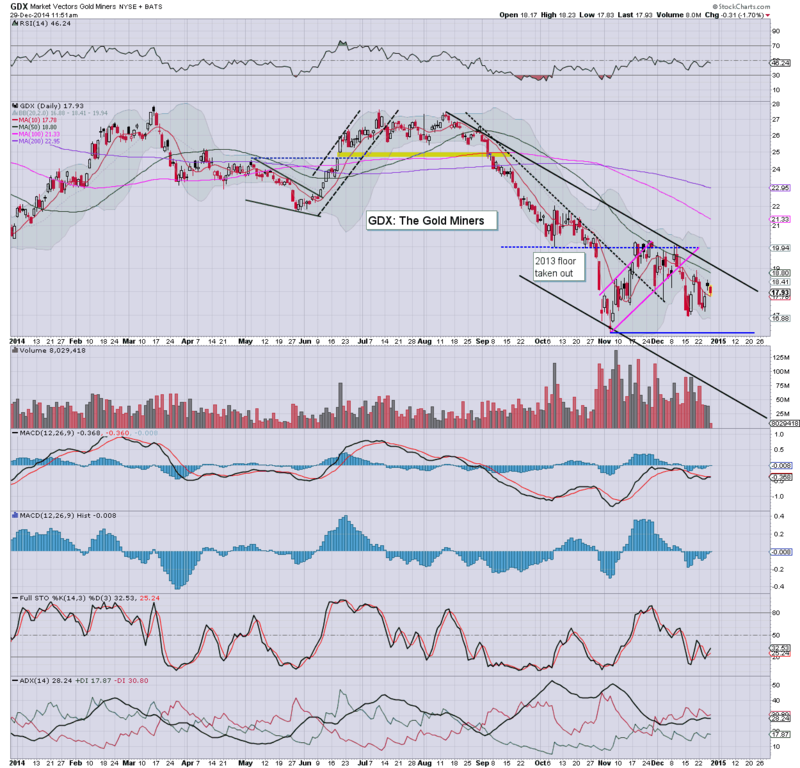 Oil is seeing moderate chop, +0.5%... but looking highly vulnerable to losing the $50 psy level in the near term. *oil bouncing... price structure is a clear bear flag on the hourly... now stuck against the old broken floor. This remains classic holiday trading conditions (Thursday is closed of course)... and this is no market for anyone trying to capture minor down cycles. To me... seems a complete waste of time. Good morning. 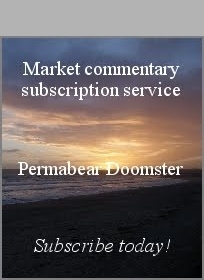 Futures are moderately lower, sp -6pts, we're set to open at 2084. Metals are rebounding, Gold +$15. 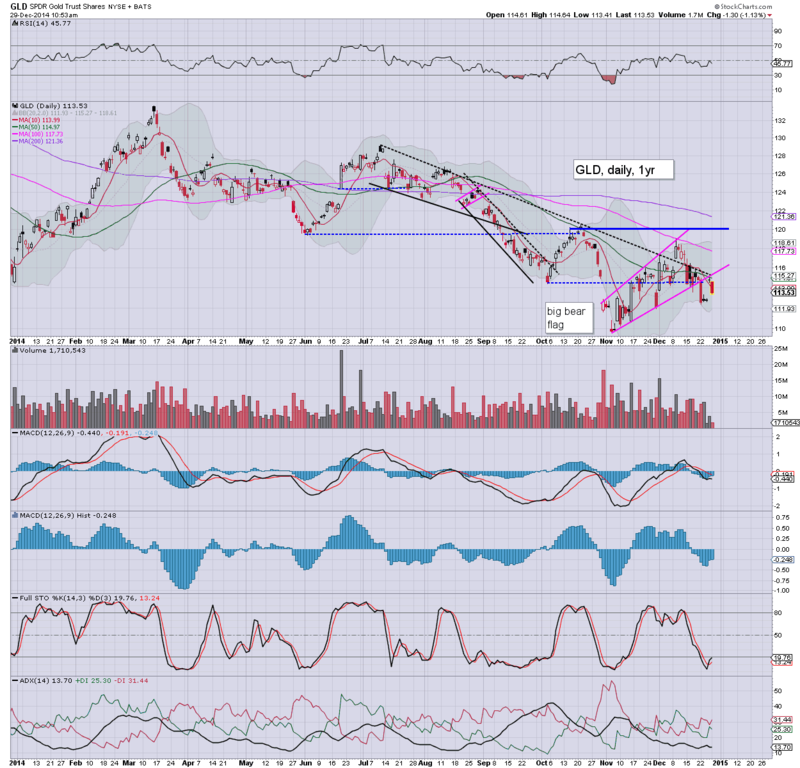 Oil remains weak, -0.8%... having yesterday failed to hold the recent $53.60 floor. So... a little lower, but like yesterday, there is ZERO reason why this will turn into anything significant. Market is still headed to the sp'2100s...and far beyond. As ever... 'don't get lost in the minor noise'... and that sure applies to 2015.. as much as it has this year. Notable early strength: GDX +2.0%, reacting to the early metals jump... but that looks unlikely to sustain itself for more than a day or two. Whilst the broader US market remains contentedly climbing into year end, there was notable weakness in the energy market. 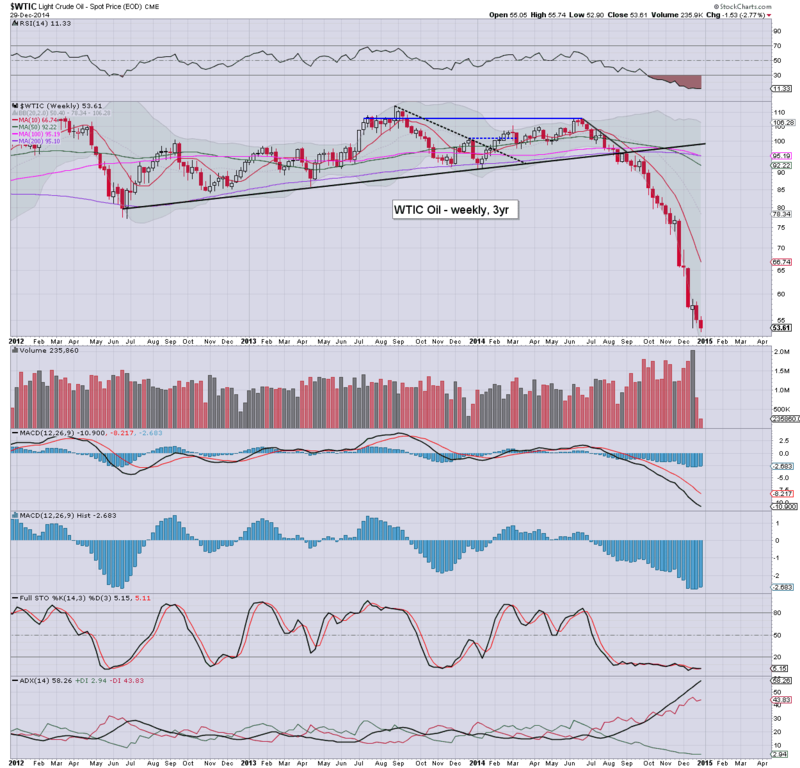 WTIC Oil broke a new multi-year low of $52.90. 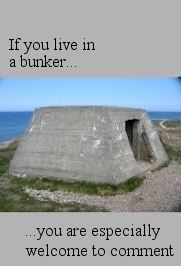 The door is now open to the $50 psy' level, after that... $45. Suffice to say, the recent micro double low in the mid $53s was rather decisively taken out today, and bodes for continued downside across much of January. I'm somewhat surprised, although US dollar strength was always going to remain a major hindrance to any near term bounce. Tuesday has Case Shiller HPI, and consumer confidence. In the scheme of things though... neither are particularly important enough to significantly move the market, in what is just another quiet holiday trading week. 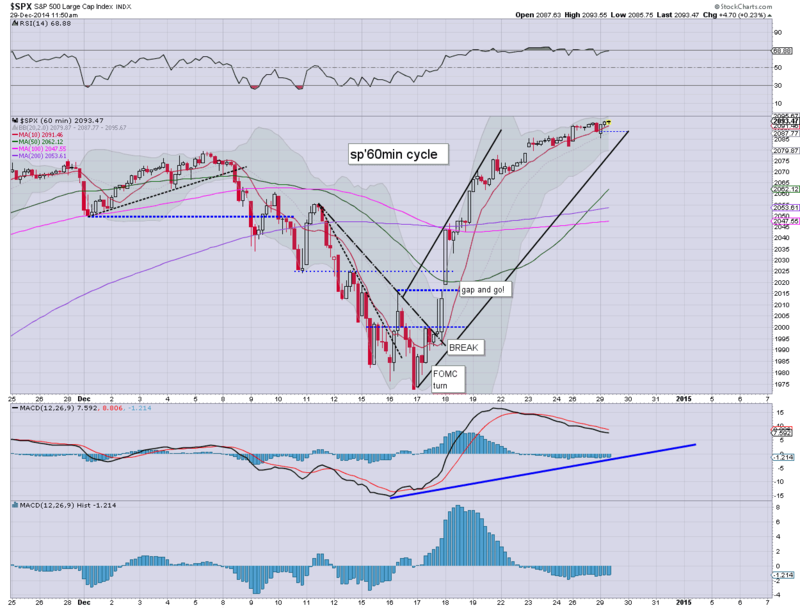 US equities broke another pair of new historic highs, sp'2093, with R2K @ 1220. Near term outlook remains bullish into January. All the bigger trading cycles are offering sp'2130s before the next opportunity of a minor down wave. 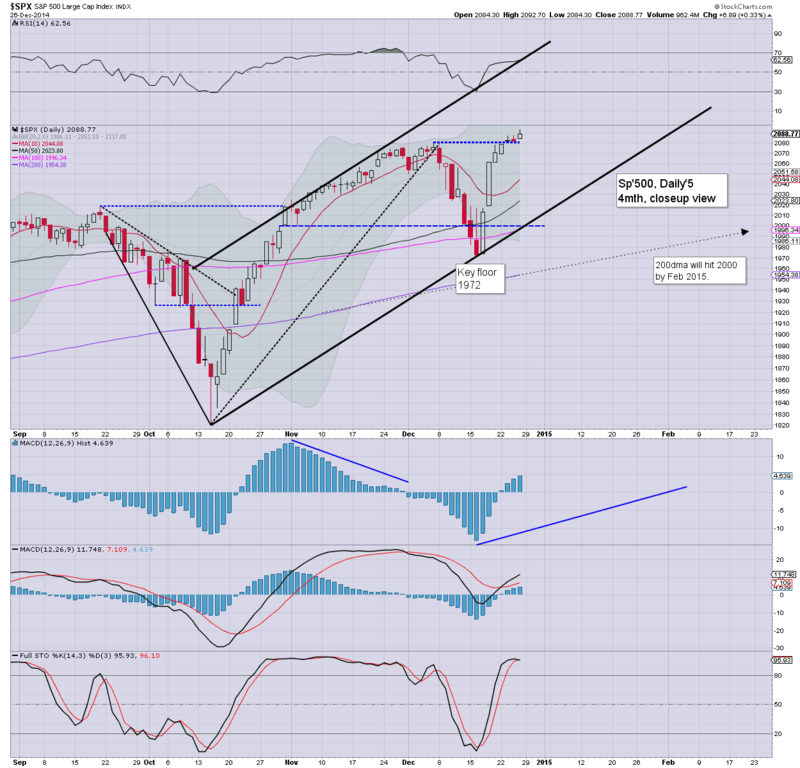 A break under sp'2k looks unlikely for a very considerable time. What should be clear.. the breakout in the R2K is an extremely important event, and bodes for broad upside across much... if not all of 2015. 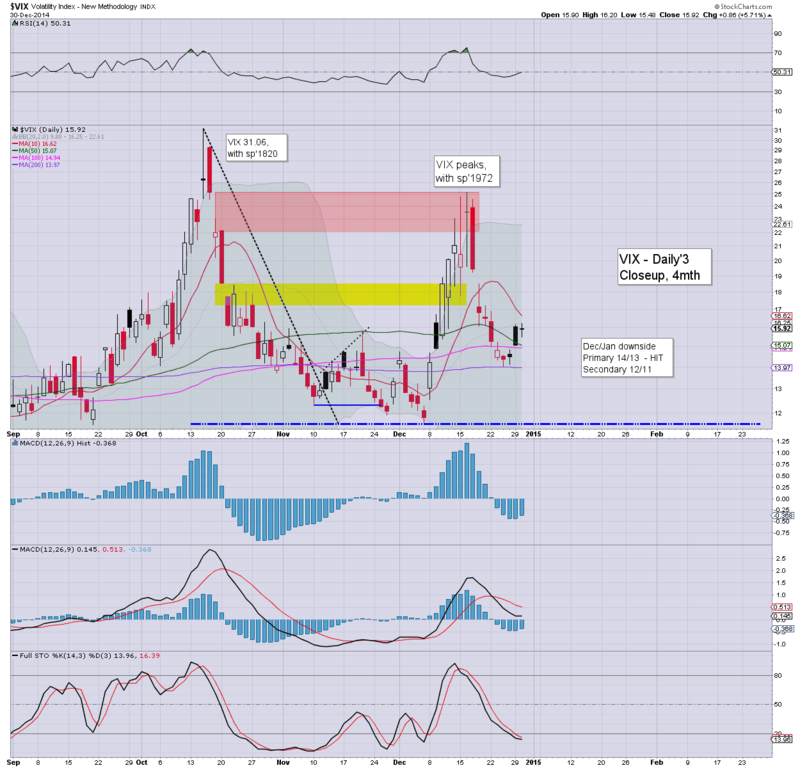 VIX remains relatively subdued, and considering it is a holiday trading week, VIX will probably melt lower later this week. The 12/11s certainly seem viable. US equity indexes climbed for the second consecutive week. 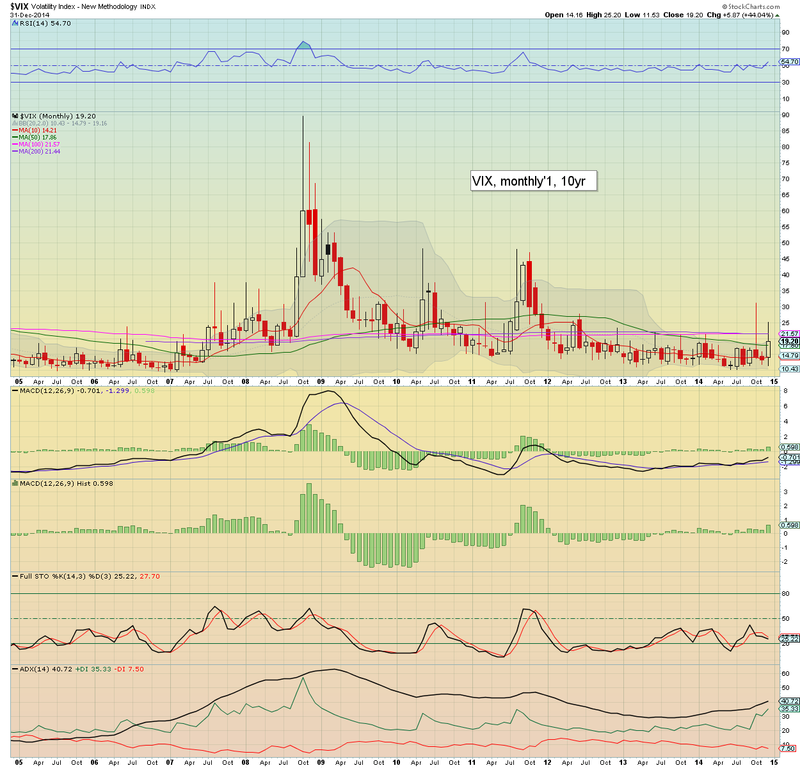 Net weekly gains ranged from 2.3% (Trans), 1.6% (R2K), to 0.9% (NYSE Comp, Sp'500, Nasdaq). 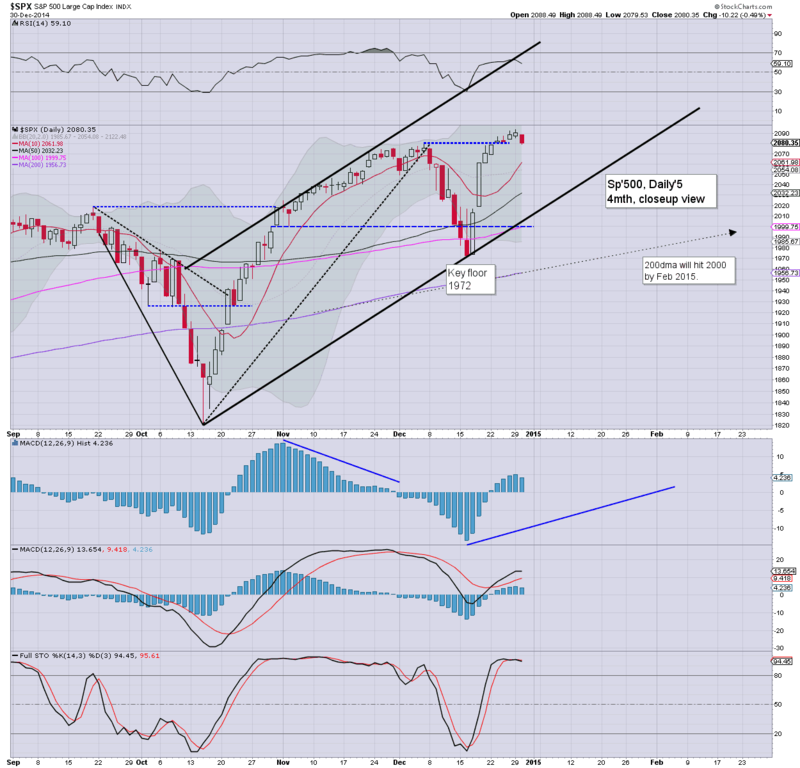 Outlook into January remains bullish, with the next soft target zone of sp'2130/50. 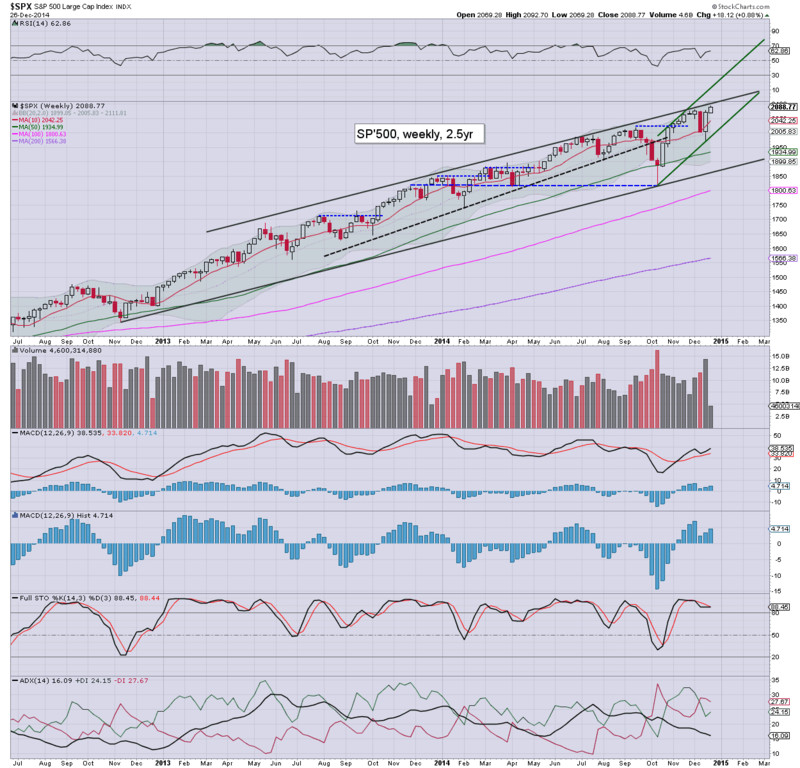 Considering the bullish break in the R2K, a straight run to the 2300s is viable within 3-4 months. A second weekly gain... 18pts (0.9%), with a new historic high of 2092. 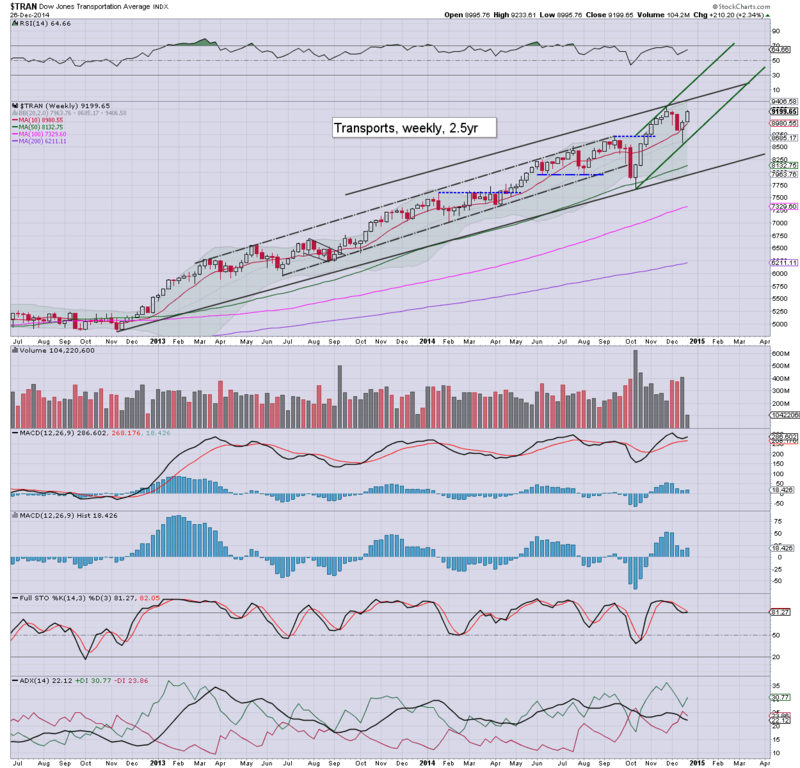 The short term trend has accelerated, the 2100s are due, whether by year end.. or early January. 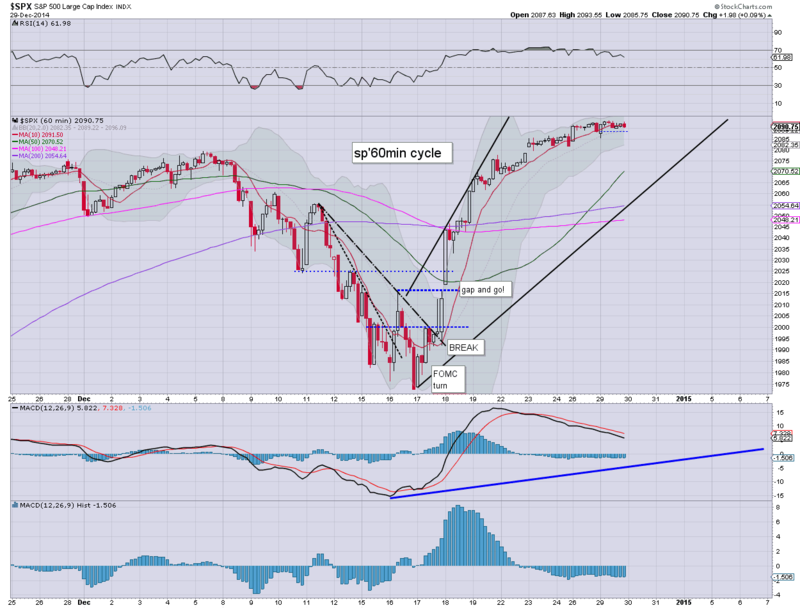 The weekly/monthly cycles are both offering the 2130s by mid January... 2150/60s late Jan/early Feb. 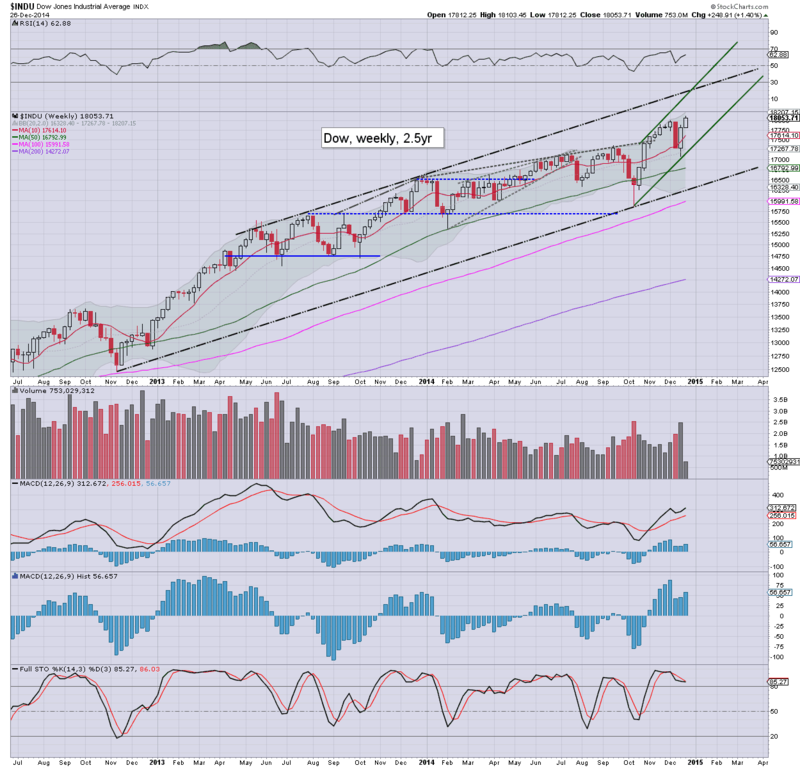 The 2200s look more likely after another minor pull back of 3-5%. 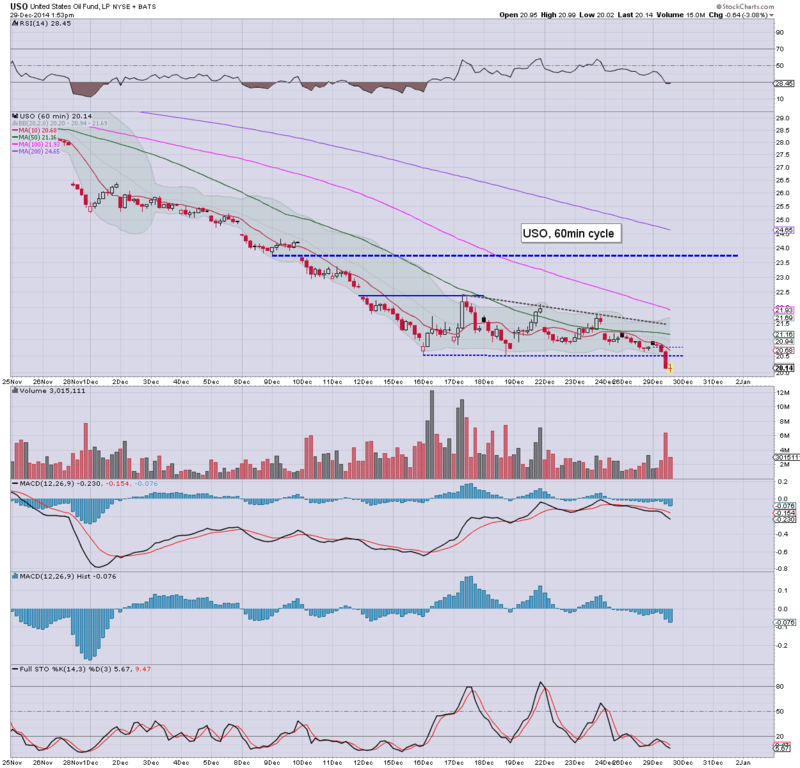 The 2300s look very viable by late spring, with 2500s sometime in summer 2015. 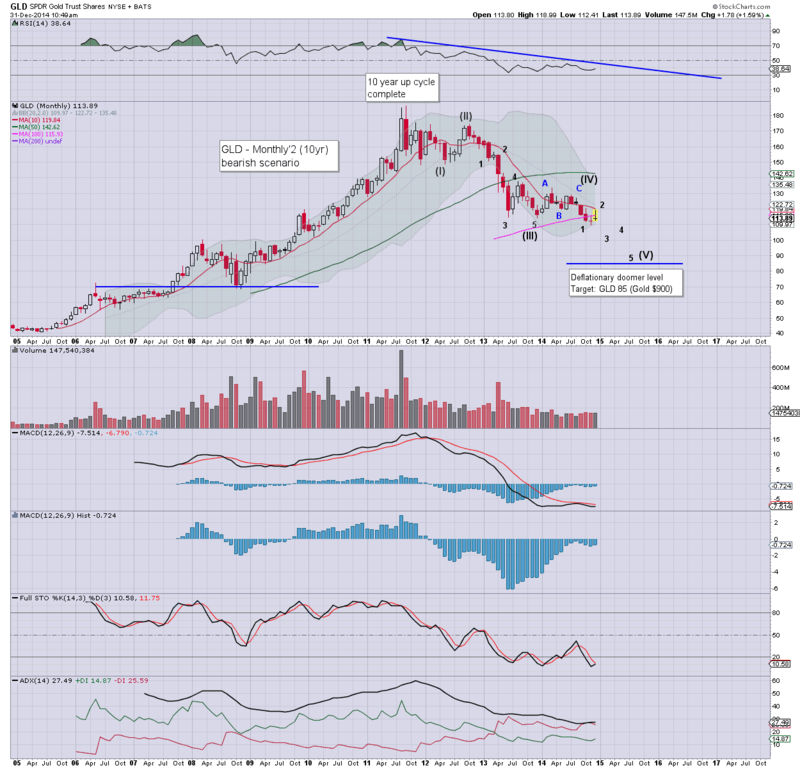 The tech' has broken a post 2009 high of 4806.. a mere 326pts (6.8%) below the March 2000 'tech bubble high' of 5132. 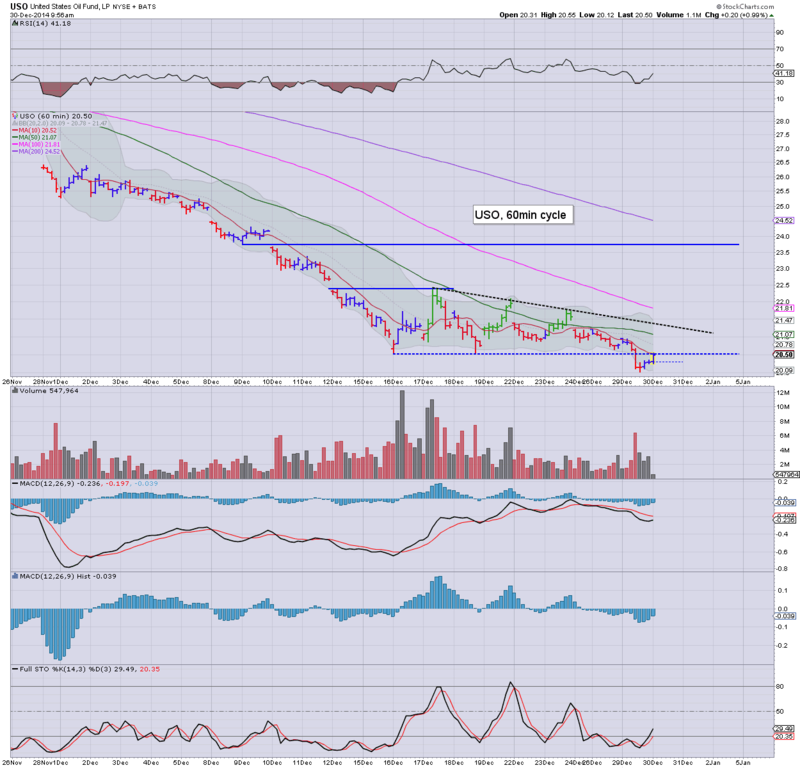 That now seems likely to be hit in spring 2015. 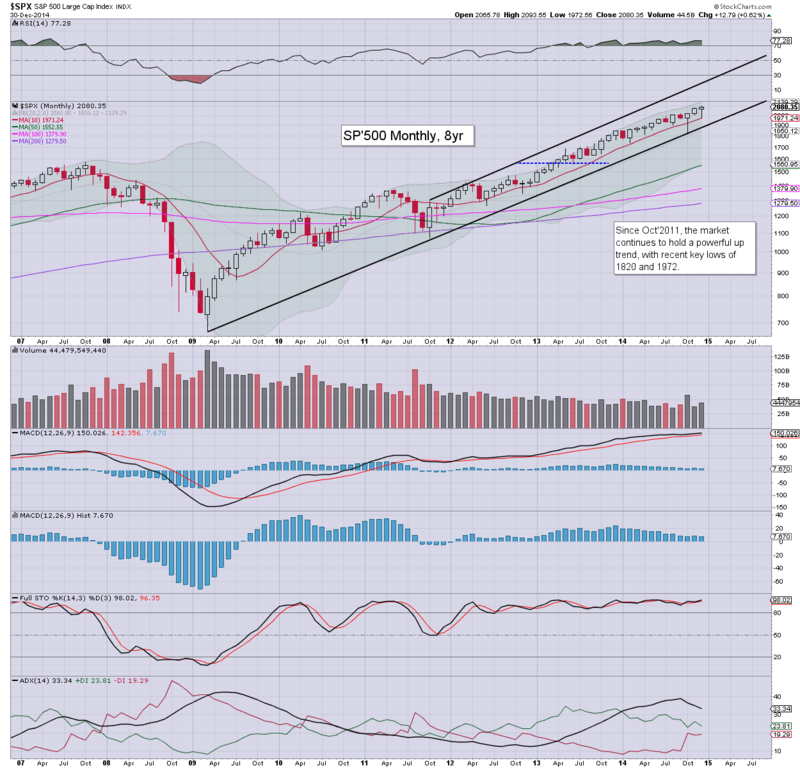 Any monthly close in the 5200s will open up the next primary target of 7k.. which is a huge 46% higher. The mighty Dow gained a very respectable 248pts (1.4%) this week. 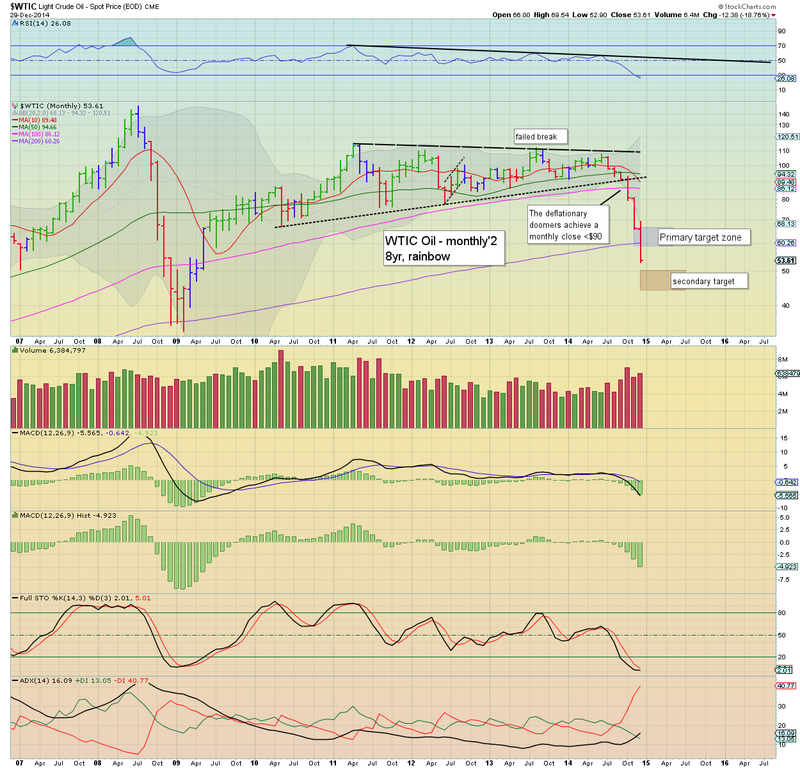 There is near term upside to the 18300s, and 18500 by late January. Next key fib' level is 18974, which seems viable in the spring. The next giant psy' level is 20k.. which appears likely into the summer. The master index gained around 0.9% this week, having broken the 11k threshold (briefly) on Friday. Next upside target are the 11300s. 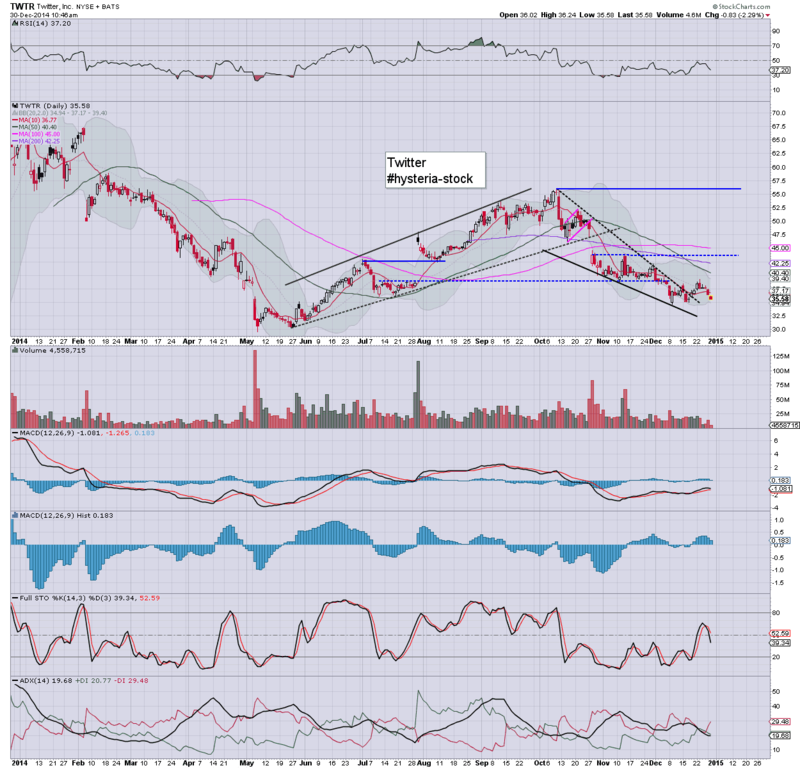 The second market leader has seen a critical breakout to the upside, having been stuck for the year. 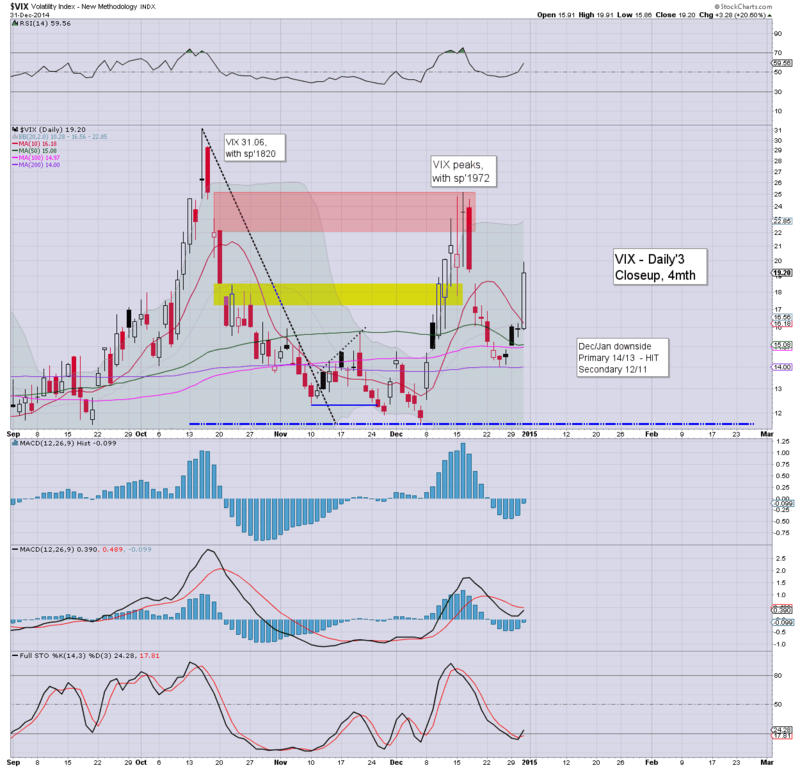 The double top of March/July - 1212/13 has been decisively closed over, with a new historic high of 1217. 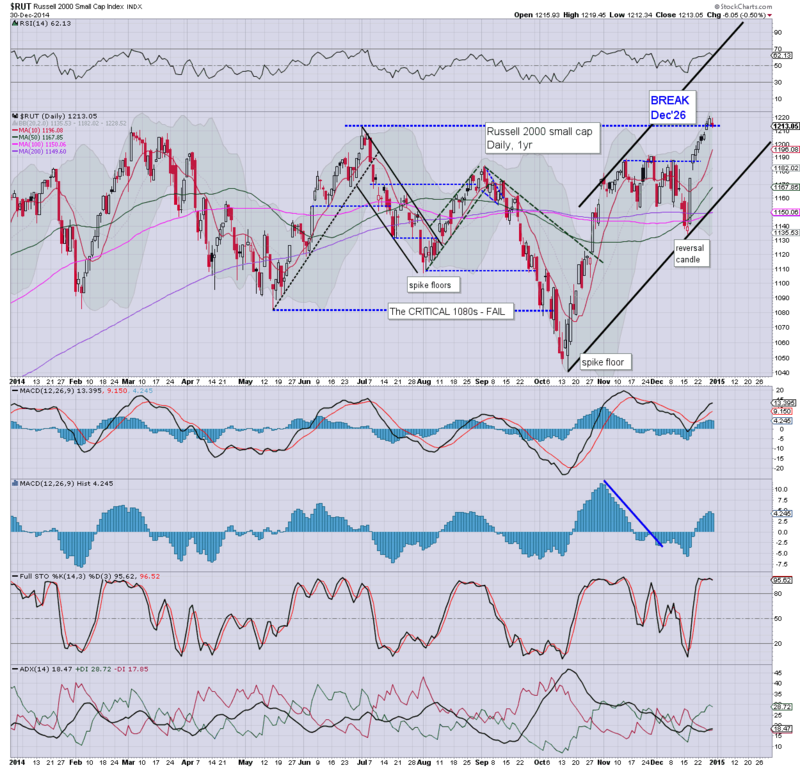 The breakout in the R2K is arguably the most significant bullish event in the past few months.. perhaps even the year. 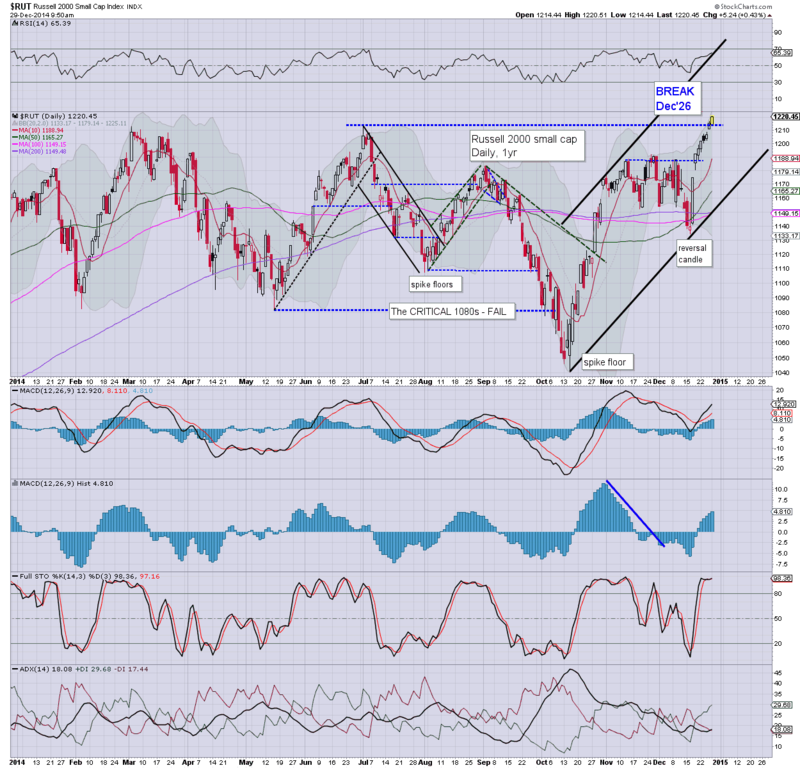 Next upside target are the 1300s... the 1500s by end 2015 look very viable. The 'old leader' is leading the way, with another strong weekly gain of 2.3%. 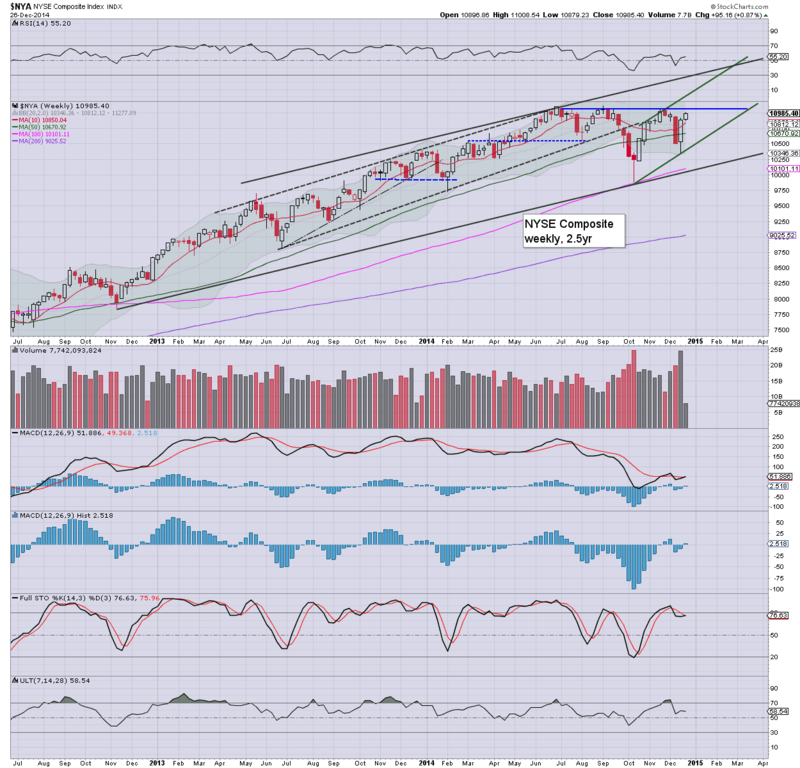 The 9500s look likely in Jan/Feb... before the next possible retrace. A break <9000 in the next wave lower looks highly unlikely. 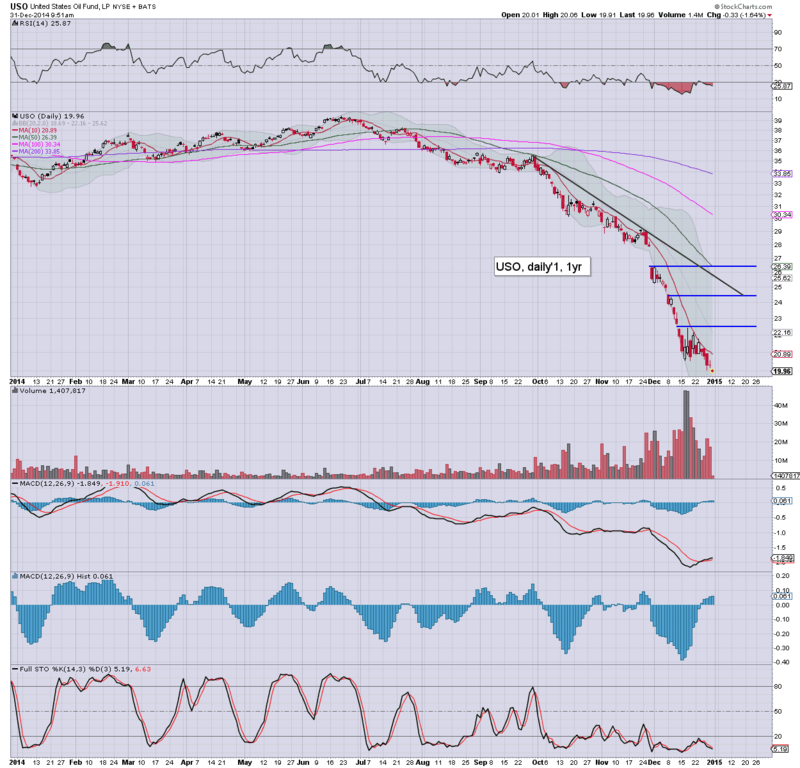 The giant 10k threshold looks a reasonable target for 2015, although the transports stocks will be somewhat laggy if Oil has seen a mid term floor in the $53s. Suffice to say.. a second week higher, with new historic highs not just in the Dow and sp'500... but far more importantly... in the R2K. 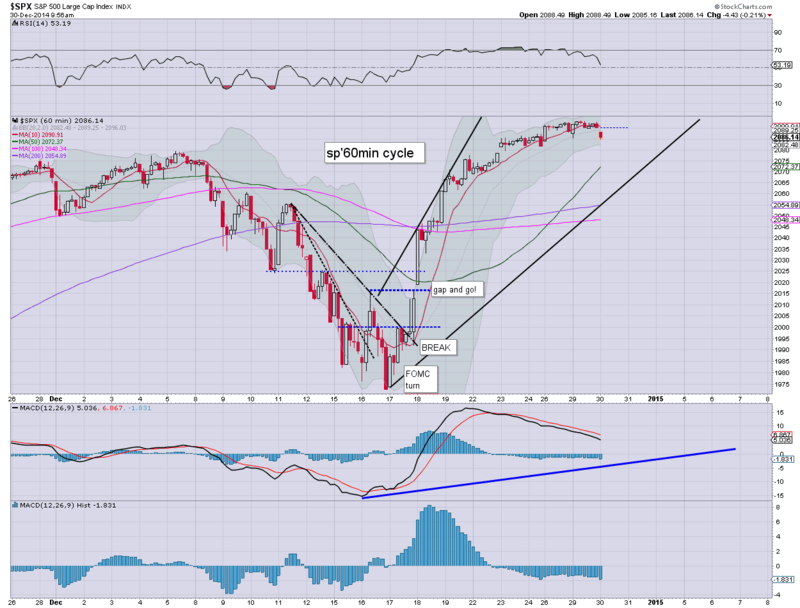 Further upside into Jan' 2015 looks highly probable. 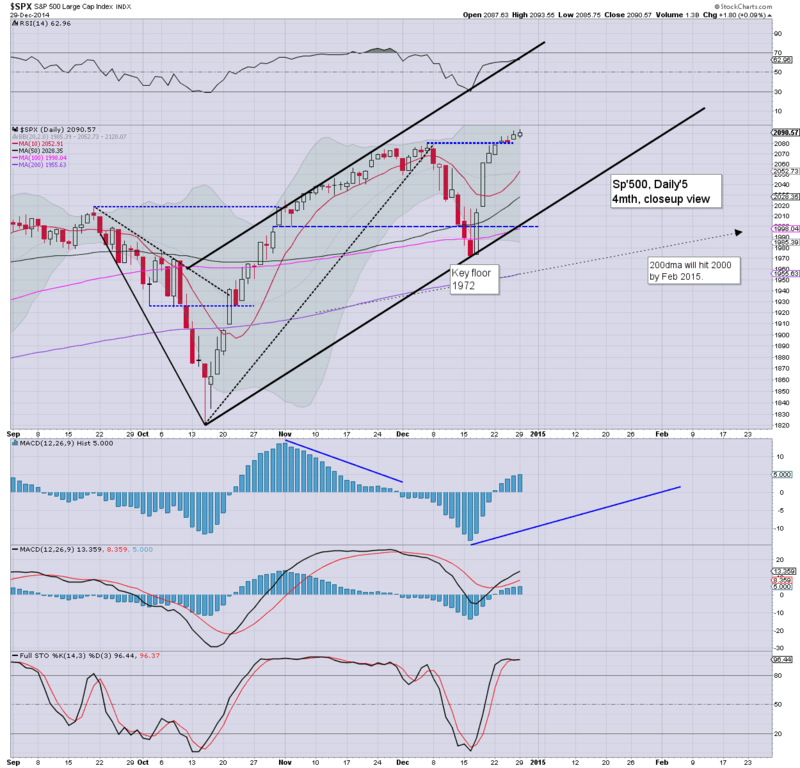 At best, equity bears might achieve a few weeks of downside, starting somewhere in the 2125/50 zone. 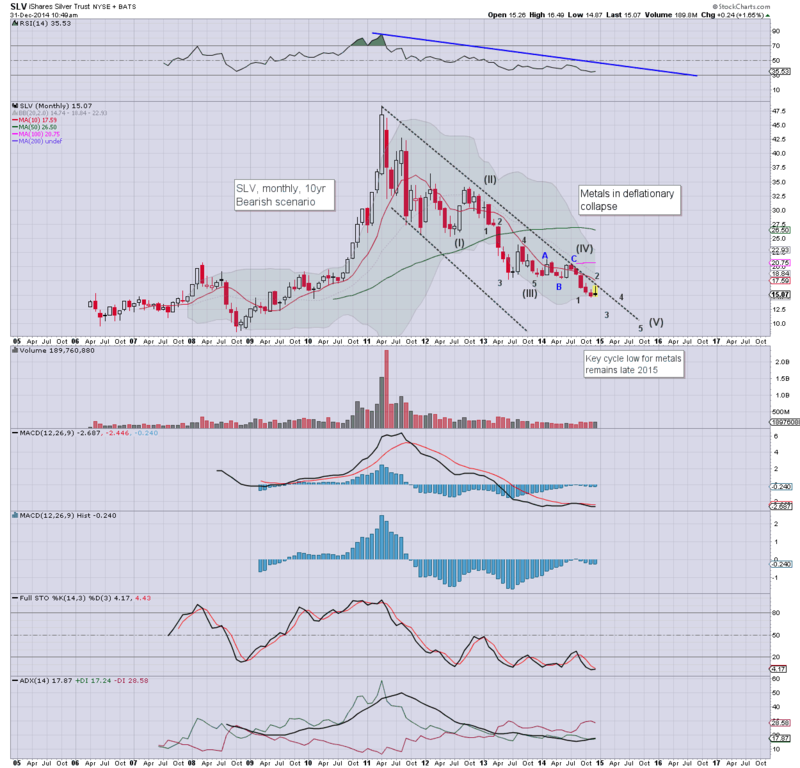 On no outlook does sub sp'2k look viable for a very considerable time. Again, it will be a short trading week... the only notable data is Chicago PMI on New Years eve.